26.2 Quest: Pearl Izumi SyncroFuel XC - A Great Shoe! It was nearly two months ago when Pearl Izumi contacted me and wanted me to review a pair of the SyncroFuel XC's. At first I was a bit apprehensive because I have tried Pearl Izumi one other time about a year ago and didn't get past 7 total miles in the shoes before retiring them to the closet. It turns out the reason I didn't get past 7 miles was because the shoes were too narrow and just plain hurt, not an indication on how good the shoes were. I received the shoe and was anxious to give it a go. This shoe is more of a neutral shoe than I have ever run in so I was cautious as I first laced them up. When I received the shoes I had never ran off-road or on trails and this shoe is designed for trail runners. I planned on taking it on the road first to see how it compared to what I was running in and then taking it to the trails to give that a go as well. You can see how my reviews continued each time I ran in them by reading what I said in my running log each time I ran. Here is a link to all my runs in these shoes. When I first took these shoes out of the box I really liked the way they looked. I had to give it some time to make sure it wasn't the chemicals in the new shoe smell that was making me think that, and even after that high went away I still felt they were a nice looking shoe. The other thing I noticed immediately was how much lighter they were than my current New Balance 769's were. I haven't checked to see what the official weight difference is but the perceived weight difference was really noticeable both in hand and on the foot. A couple weeks after getting the shoes I took them for their first trail run. This trail run was also my first trail run as well. I loved the run and the shoes were great as well. I felt very few of the roots and rocks. The trail run really gave me a great test of the cushioning and sole of the shoe and I was impressed. I have raced in these shoes twice since getting them. The first race was a 5k race, The S.W.A.T. Trot, and I set a new PR.... coincidence? :) The second was just this past weekend when I ran the Peachtree Road Race 10k on the 4th of July. So what is my overall impression? The Pearl Izumi SyncroFuel XC's are currently my favorite shoe (as evidenced in how often I run/race in them). I run in three different shoes right now and they are my current favorite. 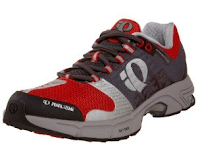 Since I run roads primarily I wonder how these stack up to the road version of this shoe, the SyncroFuel (non XC). If the road version is anything like the trail version I am sure they would also hit the top of my list. I really like the way they look! If I ever get to run again, I'm going to look around at different shoes. I'm not sold on the ones I have now. Thanks for the review! I am looking for a lighter trail shoe for some upcoming races, so I may now consider these. @kerrie - hopefully you will be able to get out there and run soon. I wouldn't have initially bought these for myself, but now that I have tried them I would buy them in a heartbeat. I know what it is like to not be sold on what you are currently running in. I have run into that with my daughter's shoes as well. I used to own Pearls! I loved them! Then the style got discontinued and I was placed into a different brand at the running store.